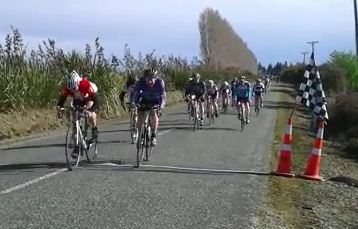 10/10/2011 - After a morning of wet weather in Invercargill I decided to take all my warm & wet weather gear and head to Te Tipua for Saturday’s road race. As we travelled out to the start the weather improved and by the time we lined up on the start line the sun was shining and the temperatures were in the mid teens. It didn’t take long for the first attack with Wayne Harding going off the front on the downhill, not sure if was an attack or simply the Wayne has and advantage downhill over the smaller riders. Wayne’s attack didn’t last long as he punctured within the first kilometre. After a quick repair and ride in a vehicle Wayne rejoined us about 10km later on the main climb. After Wayne’s attach we settled down with the whole group lapping through. Round the back of the course the first time Zane Butson, Georgia Timpany and I found ourselves about 50m lead after Mike Copper let us ride off the front. After a few kilometres we were caught and at the end of the first lap we were all together except for point series leader Max Anderson who had punctured. Down the hill the second time Ant Leathart rolled off the front and I joined him. We were joined by downhill specialist Wayne Harding and after a brief taste of freedom we were caught. Up the hill the second time Tony Raggart rode off the front but with no assistance he was soon caught. I tried one more attack on a downhill on the back of the course but as I rounded a bend in the road I found that a farmer was moving some sheep across the road. I slowed, as did everyone and my attack was over. After several more unsuccessful attacks, Georgia led us into the finishing straight. With everyone riding close to the centre of the road and looking over their right shoulder for the sprint to start, I decided to go down the far left of the road. As I went for my sprint and asked the legs for more power the reply was the same a when Captain Kirk asked Scotty for more power “I’m giving you all she’s got” that was my sprint over. Garry Steadman & Garry Perkins fought out the sprint finish with the former coming out on top in a close result. Thank you to all my fellow riders for making it a great day especially the juniors who were all prepared to do their share of the work and late in the race were initiating many of the attacks. Also thanks to race manager Aaron Sinclair, marshalls and Lindsay Tait-Jones without whom we could not race.